A concise illustrated aid to collecting and processing plant specimens and label information for the BOTY 211/311 Herbarium Assignment. 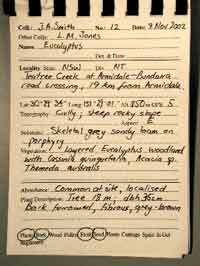 a) Herbaria universally use latitude and longitude for 'point' data (rather than AMGs that are popular with New South Wales government organizations such as National Parks and Wildlife Services). The best source of point data is a geographic positioning system (GPS). Topographic maps, especially at finer scales, are good because data can be collected down to seconds. An atlas should be used as the last resort as it will only allow calculation of point data down to minutes. b) Collect whole plants for herbs and small ferns such as this Ophioglossum (BOTY 211 students, however, should only be including flowering plants, and no ferns). c) Bark may be collected and included with the specimen, but don't forget to describe the extent, colour and morphology of the bark for trees and shrubs. 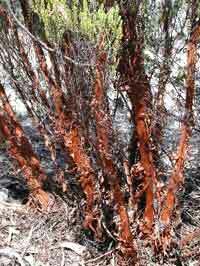 The bark of this Micromyrtus is particularly distinctive. a) Delicate parts of specimens, such as the flowers of this Goodenia will not stay in good condition more than a few minutes after collection, and even if placed in a cool, humid plastic bag are subject to damage. Such specimens should be pressed immediately in the field using a day press. b) A day press, usually without foams and cardboards, provides a temporary and portable means for pressing specimens on-the-spot in the field. 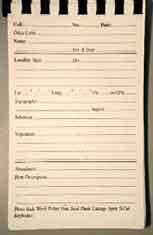 In most cases, only a single sheet of paper per specimen is used. 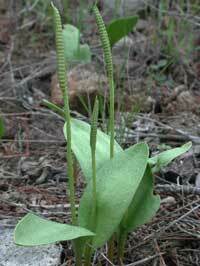 a) Small herbs and ferns: Collect base of plant. 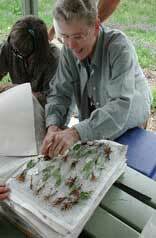 Collect multiple specimens. 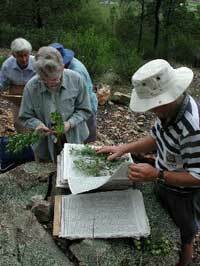 There are enough specimens being set out here for pressing and drying to make several good herbarium sheets (i.e. a sheet for NE, Stud. 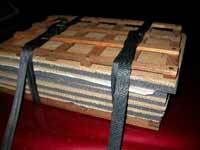 the student herbarium, and a 'duplicate' or two to be sent to other herbaria). 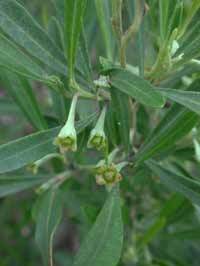 a) Separate specimens should be collected from male and female plants. These are given separate collecting numbers (and cross-referenced in the collecting notes). 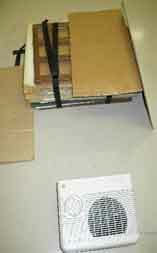 a) This is a press with cardboards, foam and paper, ready to use in the field directly or into which you can transfer specimens from a day press. 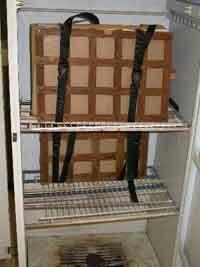 b) To maximise the number of specimens in the press, place a specimen on both sides of the foam. c) For springy monocots that are too long for the sheet and are zigzagged in the initial pressing, two sheets of paper can be used to hold the specimens in. 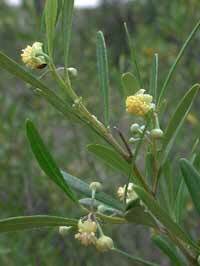 d) Foams allow leaves and flowers of the specimens to be pressed flat even when the specimen is bulky. Scrunched up newspaper, to fill in gaps, can be used as a stand-in for foams. 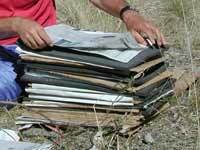 a) A collecting book should be used to record information about the plant collected, the location and site of collection, in the field at the time of collection. b) Record the collection details in your collecting book and (starting at 1) use a unique collecting number for each collection. 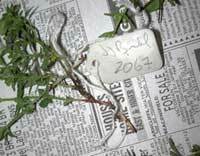 c) This is the same (name and) number on the tag attached to the relevant specimen(s). a) We place presses complete with cardboards, foams and specimens in paper in the dryer so that the warm fan forced air (<45 C) is directed through the gaps of the cardboard corrugates. b) You can construct a makeshift dryer anywhere you have access to power, a fan heater (set on low heat) and a few extra sheets of cardboard. a) Labels may be generated from collecting book data (see above) using student label template available from Jeremy Bruhl.